Just how far can the appeal of family MPV models be extended up-market? 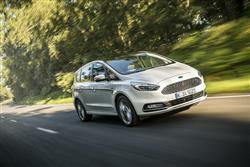 That's the question posed by the car we're looking at here, Ford's improved S-MAX Vignale, which now gets the brand's latest EcoBlue diesel engines. The S-MAX we know about: it's the best handling and arguably most desirable large-ish seven-seat family People Carrier out there. But could it also really appeal at a more exalted price point close to around £40,000 if Ford were to up the spec and include a premium customer service package? It's a big ask. Large MPVs aren't only bought by families full of sticky-fingered children looking for the least expensive way of getting a super-sized brood from A to B. At the top end, they're also purchased as business conveyances. Or by business people who have more than 2.3 kids and who want in their People Carrier all the niceties they're used to enjoying in their usual executive saloon. And the kind of dealer service they might expect to get from a prestige brand. 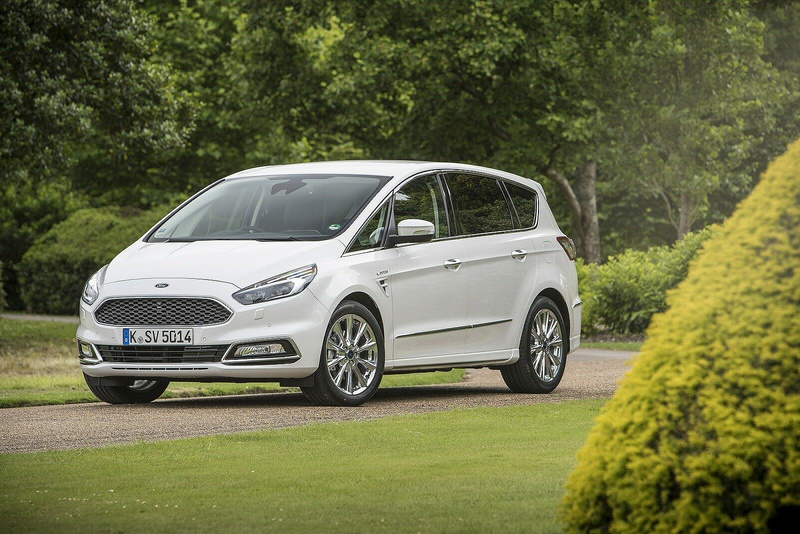 Ford thinks that there are enough of these sort of people around to justify the inclusion in its S-MAX range of this super-luxurious Vignale model. 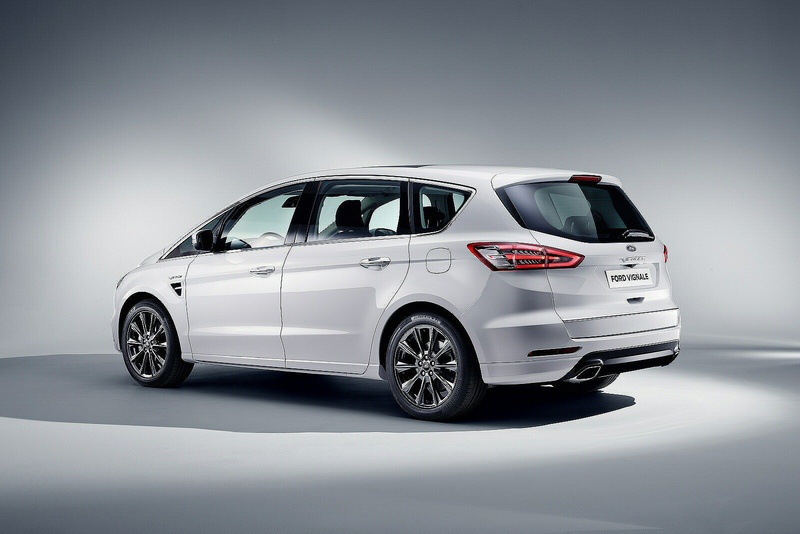 With this top variant, you not only get more luxury than has ever been seen on any MPV before but also what the brand calls 'Ford Vignale Services', a system that will give you your own personal 'Vignale Relationship Manager', there to make your ownership experience just that little bit more pleasant. As you'd expect, Ford has chosen the most important engines in the S-MAX portfolio for this top Vignale version. That means the 2.0-litre EcoBlue diesel powerplant many will want, an engine most will order in 190PS form. There are manual or automatic options, with the auto also available with intelligent all-wheel drive (I-AWD). This system continually measures how the car's wheels are gripping the road surface every 16 milliseconds; can adjust power delivery to individual wheels in 100 milliseconds; and can send 100 per cent of available engine torque to the rear wheels. Need more grunt? 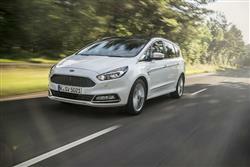 Try Ford's latest bi-turbo 2.0-litre EcoBlue diesel, which develops 240PS and 500Nm of torque, delivered from 2,000rpm. This car also now benefits from a more refined, smoother-sifting 8-speed auto gearbox which alters its shift pattern to suit your driving style. It also enables the fitment of Adaptive Cruise Control and includes an engine Stop & Go system. 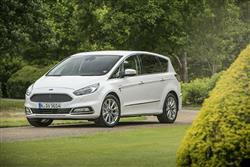 On the road, this S-MAX is as good to drive as it in its lesser guises. Ford's clever integral link rear suspension helps enhance the signature car-like, sporty driving dynamics with a configuration that features reduced-weight aluminium components. Additional sound-deadening materials and improved door seals contribute to a very quiet cabin too, creating a level of refinement appropriate to this Vignale model's more exalted price point. 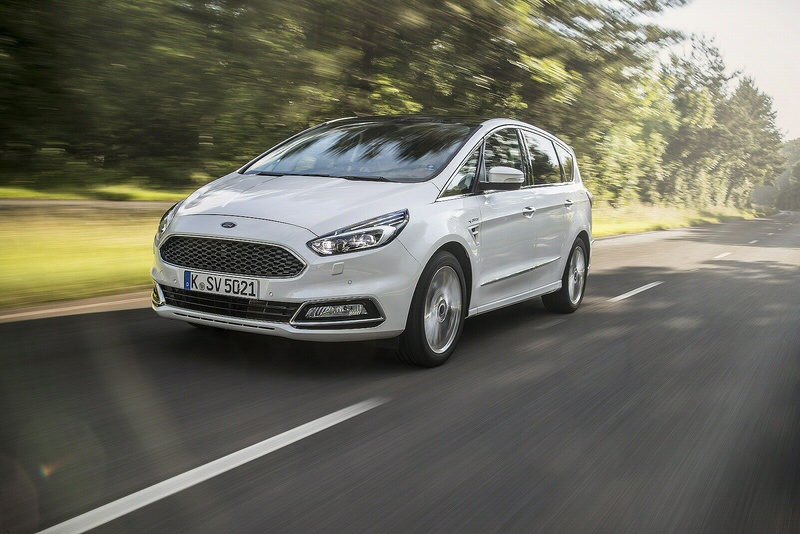 If you're graduating into one from a very plush version of the previous generation S-MAX, you'll find that road noise has been reduced by 2.5 decibels in the front and 3 decibels in the rear and Ford claims there's noticeably less wind noise than before. From the outside, there aren't too many visual cues to distinguish this top Vignale variant from plush 'Titanium' or 'Titanium Sport'-trimmed S-MAX models in the standard range, but if you look closely, a few things will start to stand out. The 18-inch 10x2 spoke alloy wheels with their Premium painted finish for example. The bespoke upper and lower 'Vignale Grilles' at the front are unique too, plus there's 'Dark Chrome' detailing and the door handles have chrome inserts. Inside, Vignale models get leather of course but in this case the hide has been extended to wrap around the instrument panel. 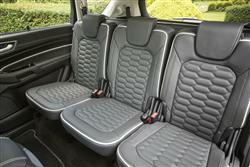 The doors get it too - and feature smart 'tuxedo' stitching. Otherwise, the recipe is as it would be in any other second generation S-MAX model. The seats have a 2-3-2 layout, and offer no fewer than 32 seating and load-space combinations, as well as Easy-Fold second and third row seats. The system enables each rear seat to be folded flat from a push-button control panel. 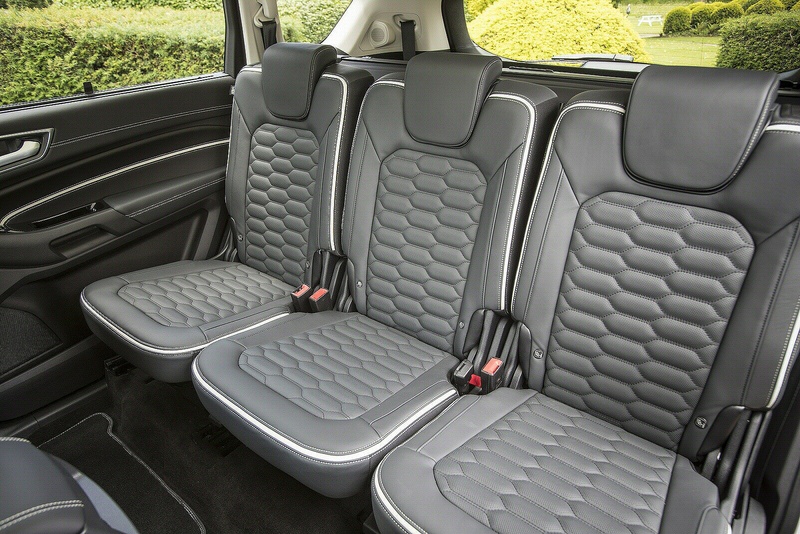 The S-MAX now features Easy-Entry second row seats that provide one touch access to third row seating with a new design that tips and slides the seat forward in one action. Storage also includes new covered stowage in the instrument panel top, a media storage area incorporated into the centre stack, and concealed under-floor stowage behind the third row. Out back, there's plenty of room in both second and third seating rows and a luggage capacity that varies between 285 and 2,020-litres, depending on the seat configuration. 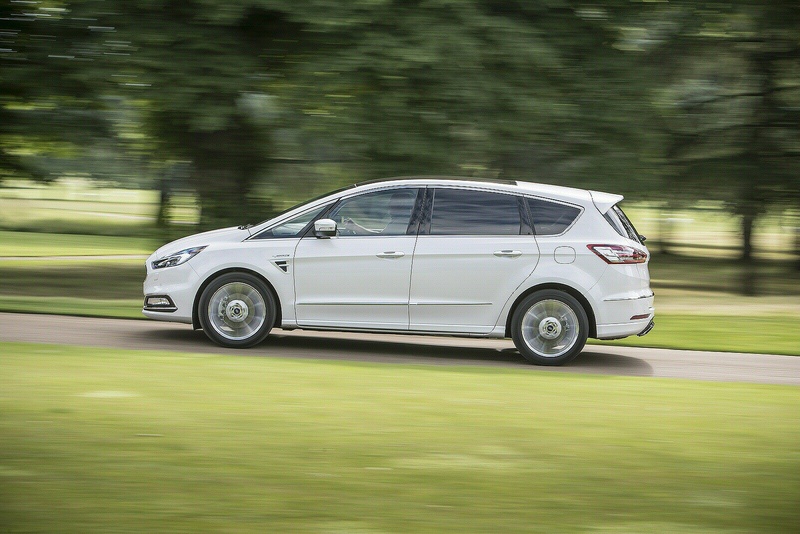 The Vignale package comes at a premium of around £4,500 over what you'd pay for an identically-engined S-MAX with plush 'Titanium' trim, so you've really got to want it. Pricing starts at just over £37,000 for a manual gearbox 2.0 TDCi 190PS variant, but most customers are going to want the 6-speed Powershift auto transmission - which will push that pricing figure close to around £39,000. Another £1,800 will also get you AWD with that package for year-round 4x4 traction. 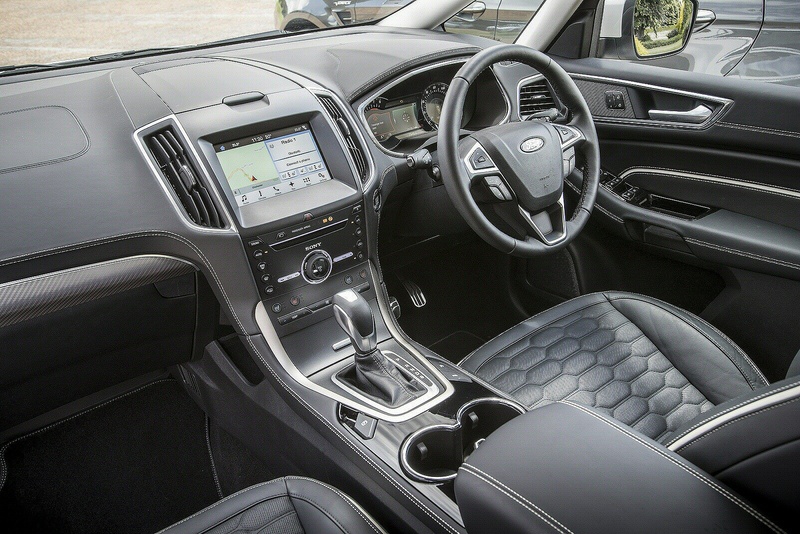 Standard equipment on all S-MAX Vignale variants includes high-grade leather trim, special 18-inch alloy wheels and the brand's latest 'SYNC3' touchcreen infotainment system. 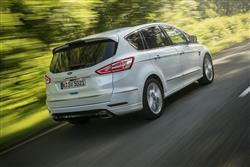 Vignale models are sold primarily at premium 'Ford Store' locations in the UK. At this model's launch, there were 55 of these, enough, says the brand, to ensure that 90% of the population will be with an hour's drive of one. Each of these dealerships will have a dedicated Vignale Lounge area. And owners will be assigned a 'Relationship Manger' who'll be on hand in the dealership and via a hotline to look after their needs. When the time comes for servicing, you'll enjoy a free collection and return service and after every garage visit, your car will get a complementary carwash and premium valet treatment. The diesel engines both return excellent economy. 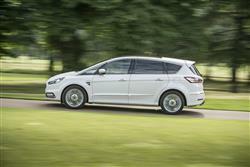 The most popular S-MAX Vignale is likely to be the 2.0 EcoBlue 180PS variant and in this one, you'll see 54.3mpg on the combined cycle and 137g/km of carbon dioxide on 18" wheels. You'll hit those returns by nearly 10% if you opt for four wheel drive or the Powershift automatic gearbox. At the top of the range, the 240PS Bi-Turbo EcoBlue variant manages 47.1mpg with 156g/km emissionson 18" wheels. The warranty is a 3 year/60,000 mile deal with Ford Assistance for 1 year, providing roadside assistance in the UK and throughout Europe. 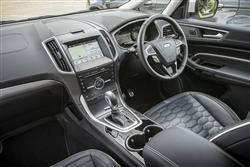 To take the hassle out of paying for scheduled work on the car, there are two 'Ford Protect Premium Plans' on offer. The first covers two years and two services, while the other extends to three years and a trio of garage visits. These packages can be passed on to another owner when the car is sold, which might help residual values. 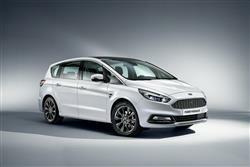 If you�re looking for a new Ford S-MAX Vignale 2.0 EcoBlue 190 5dr Auto Diesel Estate for sale, you�ve come to the right place. At Bristol Street Motors we don�t just have the best Ford S-MAX Vignale 2.0 EcoBlue 190 5dr Auto Diesel Estate deals, we also offer friendly advice and help with all your enquiries to ensure your buying experience is a happy experience.